Evan Chambers of Pavonine Glass discovered his preferred medium 10 years ago, when he saw a glass blowing at Carl Radke’s Phoenix Studios not far from his California home. Soon after, his sister snuck him into a glass-blowing course she was taking at Cal Poly San Luis Obispo. Chambers, the son of two Pasadena artists, jumped in with both feet. 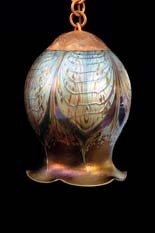 He took courses and did studio work with George Jerich and Sonny Cresswell, specialists in Art Nouveau lustre glass. 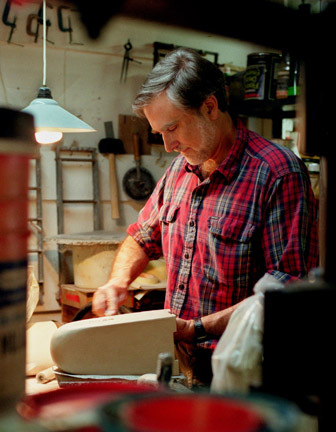 For the past four years, he’s owned his own studio with a partner, glass artist Elaine Hyde. Evan feathers the glass with a pick. “Elaine especially has really brought me up to speed on how to get a nice luster,” says Chambers, now 28. Adding luster to Art Nouveau glass is tricky. Tin must be added at just the right temperature, in a matter of seconds at the very end of the process, and interact perfectly with the silver in the glass to create the desired effect. “It’s the combination of these two metals that gives lustre glass a good luster,” Chambers says. Another trademark technique for Art Nouveau glass is feathering. To achieve it, the artist wraps the glass when it’s still solid (before air is blown into it) with a band of glass of a different color. 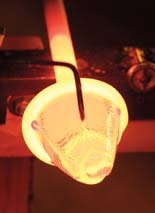 Then he takes a tool called a feathering pick and moves the hot line of glass around on the molten surface. 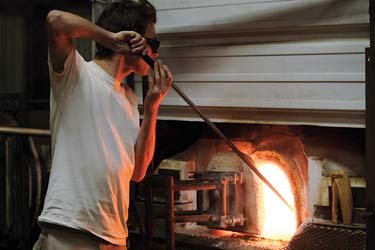 In addition to complete lamps, Chambers also creates metal sculptures, casting the bronze and copper himself before blowing glass through the piece. For more information, see Pavonine Glass in the Products & Services Directory. 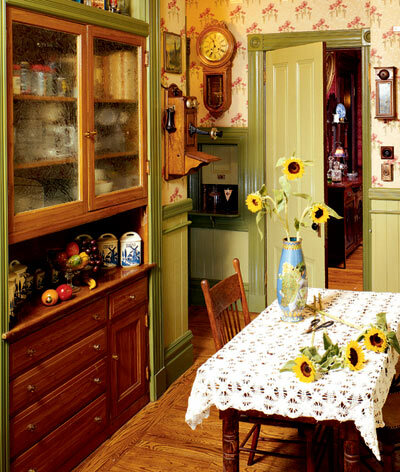 These 8 Arts & Crafts lighting artisans prove that the spirit of the original movement remains alive and well in today’s studios. Glazing—the glass configuration chosen for windows and doors—can transform interior environments by bringing in light and by opening or concealing views; glass allows connection between interior spaces and to the outdoors. Figured glass added beauty, light, and privacy to houses by fusing form and function.